A Public Information Centre (PIC) was held on Thursday Nov. 30, 2017 at the Albert McCormick Community Centre. The presentation boards that were presented at the PIC are not accessible in their current format. What would happen to the current Trans Canada Trail alignment. 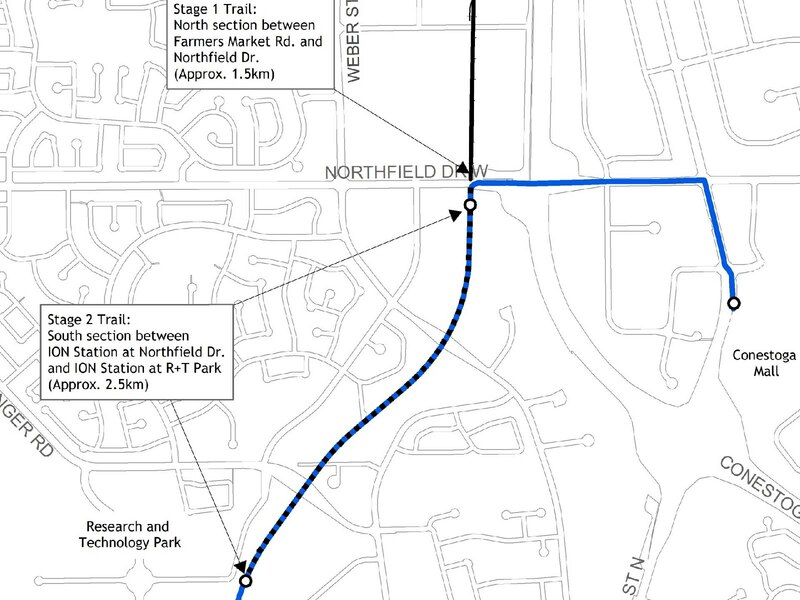 An exciting new study to investigate realigning the Trans Canada Trail between Waterloo and the Township of Woolwich has recently commenced (see the notice of commencement). Consultants WSP have been retained to assist in this work. The City of Waterloo, in conjunction with the Region of Waterloo and Township of Woolwich are collaborating to determine if it is feasible to connect the Trans Canada Trail along the rail corridor between the Research and Technology Park in Waterloo to Farmers Market Road in Woolwich. Currently, the trail diverts westwards away from the existing rail corridor towards Westmount Road connecting to Woolwich via Benjamin Road, an approximate diversion of around 3.5 km. Realigning this trail was initially identified in both regional and city cycling plans. Ultimately, constructing this trail would form an important and virtually direct multi-modal corridor connecting the Township of Woolwich to Kitchener-Waterloo and beyond. Completing this section would see the Trans Canada Trail finished between Woolwich all the way south to Port Dover on Lake Erie (a length of approximately 120 km). attract residents and visitors to cycling and walking. The study will examine how a trail can be physically accommodated within the rail right-of-way, identify issues and constraints and provide a basis for an action plan. This plan would then be used to solicit future funding opportunities to construct the trail. Funding for this study is provided by the Federal Government of Canada through the Public Transit Infrastructure Fund (PTIF). Funding timelines require the study to be completed by March 31, 2018.